Depending on your church background and experience many of you may think of the gospel (and almost exclusively) as a written message. The first Christians did not think of it this way at all. Let me explain. 1 In my former book, Theophilus, I wrote about all that Jesus began to do and to teach 2 until the day he was taken up to heaven, after giving instructions through the Holy Spirit to the apostles he had chosen. 3 After his suffering, he presented himself to them and gave many convincing proofs that he was alive. He appeared to them over a period of forty days and spoke about the kingdom of God. 4 On one occasion, while he was eating with them, he gave them this command: “Do not leave Jerusalem, but wait for the gift my Father promised, which you have heard me speak about. 5 For John baptized with water, but in a few days you will be baptized with the Holy Spirit” (Acts 1:1-5). Luke says “I wrote” in the NIV. But the NLT says, “In my first book I told you.” (That is a lot closer to what Luke means here.) J. B. Phillips nails it when he says, “In my first book I gave you some account.” Yes, it was a written account for sure. There is no doubt about that. “The first word” that is referenced here is Luke’s (written) Gospel. But this is called a “word” (see Luke 1:2 and Acts 10:36) precisely because what is behind this written account is an oral tradition. The oral gospel, simply put, preceded the written one. Verse one says that Luke gave an account of what Jesus “began to do and to teach.” The point here seems to be that this is about deeds backed up by teaching, not the other way around. I believe the sense is clear and important to notice. What Jesus “began” to do is what he will continue to do and the Acts of the Apostles clearly demonstrates that this is how we should understand the written account given by Luke. The disciples were specially chosen “witnesses” to the doing and teaching of Jesus. And most of their witness was in deed and speaking, not in written form. Only two of the four Gospels were actually written by the twelve apostles of Jesus. (Mark might have had Peter in the background in writing his account!) And most of the New Testament letters were written by one “untimely born” who did not walk with the Twelve. This fact is quite clear—the early church did not have the first of the four Gospel accounts for decades. And the last one might have come nearer to the end of the century than the beginning. This means the church grew in the grace and power of God without a New Testament text as we know it. Think about this for a moment? Before there was a written Gospel record the message of the good news was declared orally and with great power in the Holy Spirit. The church “did” what Jesus commanded and “spoke” what he had spoken. This was all passed down from person to person, or from group to group. This was an oral culture folks, not a written one. What is my point here? We are rather quickly moving away from a Western print-based written culture. This does not mean that we will not read in the future but reading will have less and less importance, at least in terms of careful, analytical, precise reading. (The fact is such reading has little to do with 99% of the world’s people.) What is coming is a culture built on action and story. The dynamic person and that person’s dynamic speech acts will shape and form the new situation in a way that looks more like the ancient world than anything we’ve ever known in our lifetime. Remember, the gospel is first and foremost an oral message that we pass along by what we do and say. Do you have a story of God’s grace working in your life? Are you a witness to the power and love of Jesus? If so you have been given the gospel message and you can speak this message, probably with more power and authority than you’ve ever realized, to others. Preaching from a Bible text in a sermon is a powerful and liberating force. But preaching the gospel story is primary for the witness of the church to those who are still outside. I believe even formal preaching inside the church would be far better, and more life-changing, if we regained the practice of orality and stopped reading sermon manuscripts! But I’ll save that for another blog. How, then, can they call on the one they have not believe in? And how can they believe in the one of whom they have not heard? And how can they hear without someone preaching to them? And how can anyone preach unless they are sent? As it is written: "How beautiful are the feet of those who bring good news!" When I was ordained, back in August of 1970, the text my pastor used was 1 Timothy 5:17: "The elders who direct the affairs of the church well are worthy of double honor, especially those whose work is preaching and teaching." I still recall him saying this means we should support, both personally and financially, those who labored in preaching. I knew almost nothing then but I was sure I was called to preach. There was, in my soul, that sense that said, "Woe is me if I do not preach the gospel." I am still amazed, even this very day as I preach the gospel in a Christian Reformed Church about an hour from my home, that anyone would listen to me preach. I am more amazed that God called me and then that he would be pleased to use me at all. "Who is sufficient for these things?" 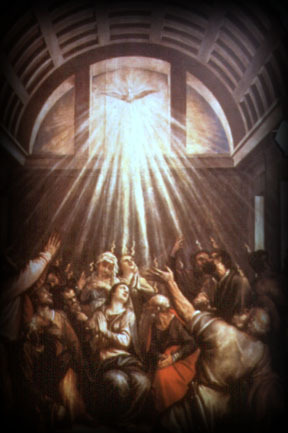 This past Lord’s Day (May 11) was Pentecost Sunday. For many it passed with little or no recognition of this great truth of our Christian faith. But for me, and the congregation of First Reformed Church in South Holland (where I am preaching regularly until the new pastor is installed on June 15,) it was a great day to worship God the Holy Spirit in the fullness of joy. I preached from the Lectionary and thus the Gospel text was John 20:19-23. This text seems not to be appropriate to the feast of Pentecost since the events presented here happened on Easter eve. But it actually fits perfectly with John’s great theme of “sentness.” This is connected to the Spirit’s power coming upon the disciples (corporately) in order to give witness to Christ and thus to speak with authority and power. This is John’s emphasis here without doubt. I think we sometimes get caught in a bind of trying to create a “harmony” of the four Gospels that defies the actual intention of the human authors and the Spirit himself. This is such a case in how we handle John 20:19-23. While Luke follows a rather chronological development in Luke–Acts the John does not do this fourth Gospel. The problem of the disciples receiving the Holy Spirit before Pentecost here is really no problem at all unless your reading of Scripture has to flatten everything to make it fit into your tiny grid. The central emphasis here is clearly that the Spirit creates joy and peace in these disciples and then grants them authority and responsibility. And the promise to forgive or not forgive sins is not singular but corporate if this text is read canonically and correctly. F. F. Bruce rightly wrote that “Post-resurrection there is not a note of hopeless sorrow in the New Testament.” Amen! I said to Laurie, “At this stage of my life I work harder on preparing the preacher than the sermon. I have a good idea about how to preach most texts. I have few notes at all when I preach. I move from point A to point B to point C and then to the finish line but I am willing to wander here and there and pick up strands and free flowing thoughts as I go along. I can do this since I do not follow a manuscript. I said to her that by this means: “ I can hear the music, sing the words, enter into all the prayers and the precise moment of what is happening and then pray, ‘God speak through me as your servant and it just seems to happen.’” I believe this is the ideal way to preach. Young ministers will find this hard to do but they should strive for it. Preaching is not about a great script but about a great God speaking a great word to his people through a very weak human person who is entirely dependent upon him. What a great work preaching really is for those called to do it. I have been out of the pastorate of a stated congregation, except for eight months as an interim, since May of 1992. I am sometimes asked, "What do you miss the most?" (There are several things about pastoring I do not miss at all, I assure you. One is the warfare that swirls around people's dissatisfaction with the pastor, which is common to every church I know.) But there is one thing I miss very profoundly and I was made aware of this again when I preached in the pulpit of my "home" church this morning, First Reformed Church (RCA) in South Holland, Illinois. I miss doing faithful, regular exposition of the biblical text. Now I do preach a lot. And I do still preach expositions, in fact I do this primarily. But I also am asked to tackle subjects, themes and special events a lot. What made today so different was that I was asked to consider preaching from one of the Lectionary texts of the day. I chose Jeremiah 32. I chose it, I think, because I too rarely choose an Old Testament text from one of the prophets. (I have preached Genesis in its entirety, as well as from other parts of the Pentateuch. I have also preached wisdom literature and a lot from the Psalter. But the prophets have not been an area where I preached a great deal during my twenty years in the pastorate. (I think the radically different systems of eschatology inclined me away from them since I did not want to get into the various "hot button" controversies. This is, admittedly, a lame excuse and with age and experience I would not shy away now at all.) Anyway, I chose the text from Jeremiah 32 for today and I enjoyed preaching it more than I commonly enjoy preaching. Read Jeremiah 32 if you get an opportunity this week. (I hope to out the video of my sermon on our Web site soon.) Right in the middle of all the gloom and doom of the Jeremiah's warnings that God would destroy Jerusalem and Judah comes this amazing witness to hope in chapters 30-33. Chapters 30-31 are poetry. Chapters 32-33 are prose. And right in the middle comes this account of Jeremiah buying this land and sealing the deal. The whole act seemed senseless and, quite frankly, completely ridiculous if you follow what is going on here. What is really going on here? The answer is to be found in Jeremiah 32:27ff. and in the well-known promise that occurred earlier about the New Covenant written on the hearts of all who believe in a future day. God will bless his people, the whole earth will know good news, and the prophet demonstrates his confidence in this promise by this amazing act of faith in buying this land. Surely it was symbolic but it was also a very real and detailed account of a purchase made when land meant nothing to a starving and dying people. I am not sure the good people at First Reformed Church got as much from this message as I did. (I am quite sure that they did not since the preacher always gets the most from his own preaching if his heart is truly open to the Spirit of God working through the act of his preaching!) I spoke with several friends before I drove to the airport to fly to Washington, D.C., where I am resting tonight. They encouraged me a great deal about the message. Tomorrow I take part in the board meeting of the Institute for Religion and Democracy (IRD) here in D.C. Pray for me and for this strategic ministry to denominations, churches and leaders in our nation. It is a wonderful experience for me to be part of IRD when so much money and energy is being put into the so-called Christian Right, which I do not share great enthusiasm for as many of you know. There seems to me to be far too few groups that are taking the stands that IRD does without the methodology and strategy of the Christian Right. IRD has a solid perspective on the role of faith in democracy and also includes Catholics and Protestants working side-by-side for issues that concern many of us as active Christians in our culture. William Willimon is a Methodist bishop who can preach. In fact, he is quite frankly one of my favorite preachers today. He tells an important story about preaching and the motives that those who preach often bring to the process of homiletics. If you preach ask yourself, “Why am I saying this and what do I hope to accomplish by saying it?” Don’t use humility to cover up your own opinions, which are often more related to what you really want to say rather than to what God wants you to say. Know the difference and you will be a true servant of the Lord of the church.